Which is the Best Bean-to-Cup Coffee Machine of 2019? We regularly post bean-to-cup reviews, guides and even tips for choosing the best beans. But if you just want the best machine, check out our list of the top 10 bean-to-cup coffee makers in the UK below. Each has been highly rated by buyers, provides great value and, most importantly, makes a fantastic cup of coffee. If you just want the best bean-to-cup coffee machine, check out the Delonghi Eletta ECAM44.660.B. It’s an outstanding machine that consistently brews smooth espresso with a rich crema. It can even make milky coffees such as cappuccino and latte on auto-pilot. For the “coffee shop” taste from the comfort of your home, this is our top recommendation! 4 Why Buy a Bean-to-Coffee Machine? 5.1 Are Bean-to-Cup Models Any Good? 5.2 But Doesn’t Ground Coffee Remain Fresh if it’s Refrigerated? 5.3 Where’s the Best Place to Find Machine Reviews? 5.4 Which is the Best Model for Home Use? 5.5 Which is the Best Automatic Coffee Machine? 5.6 Why Are Bean-to-Cup Machines so Expensive? 5.7 Which are the Best Cheap Bean-to-Cup Coffee Machines? 5.8 How Noisy Are They? 5.9 Which is the Best Quiet Bean-to-Cup Coffee Machine? 5.10 Where to Find One on Sale or Discounted? Everyone has their own coffee tastes and preferences. There are also many coffee machines that produce cold, weak or just poor-quality coffee. This can make choosing the best bean-to-cup coffee machine a more difficult task than it first seems. That’s why we’ve put together a collection of 10 machines that provide outstanding value for almost any coffee connoisseur. Each is manufactured by a trusted brand and has proven to produce fantastic coffee with an appetising aroma, appearance and flavour. In addition, we’ve also taken into account a variety of other factors. These include how easy the machine is to maintain, whether it comes with any advanced features (such as settings memory, automatic milk frothing or smartphone integration) and even the trustworthiness of the brand. We also try to consider how easily available the model is, which is often overlooked. Our goal is to provide you with an up-to-date overview of the very best bean-to-cup models on the market at the moment. But that doesn’t mean you should just pick any of the machines on the list. Instead, choose the machine that most closely matches your requirements in terms of budget, coffee type (whether you just need espresso or also want frothy milk coffees) and feature requirements. This is the best way to get a machine you’ll enjoy using for many years to come. We want to make sure the list has something for everyone. That’s why we’ve selected a range of budgets, from low-priced models right up to premium coffee machines. We’ve also included mini coffee machine reviews for each to help you make an informed decision. The Esam 4000.b has an excellent fresh milk frothing feature. 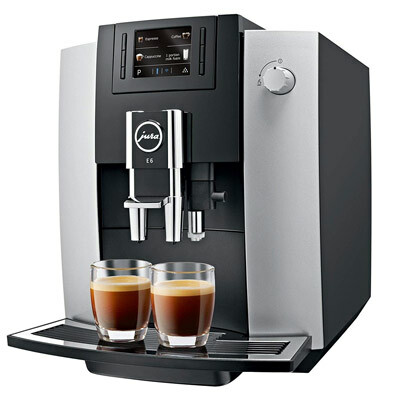 One of the most popular bean-to-cup coffee makers is the DeLonghi Esam 4000.b. It’s a fully automatic model that can turn both ground coffee and beans into an excellent espresso. 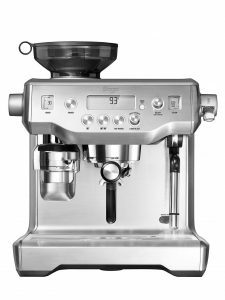 Features of the model include a milk frothing steam pipe, ability to produce two espressos at the same time and an affordable price. It’s built with a burr grinder and also includes a removable drip tray and brewing unit. The model allows you to customise your espresso, with both volume and intensity settings. Most importantly, the 4000.b produces appetising espresso with a strong taste and lovely aroma. In fact, we think it’s one of the best espresso coffee machines in its price range. You’re sure to get positive comments about the professional-looking crema. The frothed milk is also quick to heat and produces a tasty cappuccino or latte with a good flavour. One of the only downsides to the 4000.b is that it’s relatively loud when grinding beans. This is an issue with most bean-to-cup coffee machines, but it could be a problem if you want to make coffee first thing in the morning. If you’re looking for a budget bean-to-cup coffee machine for espresso and cappuccino, the DeLonghi Esam 4000.b is an excellent option. It’s a reliable model that’s a proven hit amongst coffee lovers across the UK, mainly due to its simple design and excellent espresso. It might not be as advanced as other Delonghi bean-to-cup coffee machines, but it provides great value. Click here to view this product. You can also read our full review here. The Gaggia Brera is another popular model with a built-in fresh milk frother. It’s capable of making coffee from both ground coffee and beans, is designed to be energy efficient and is relatively simple to use. When it comes to espresso, the Gaggia can make a decent cup – especially if you use ground coffee. The cappuccinos are also appetising with the frothy milk combining well with the espresso. You can customise the output using the control panel and the ceramic grinder is designed to retain the coffee’s aroma (the coarseness can also be adjusted). A handy feature is that the ground coffee compartment allows you to brew a different coffee blend without removing the beans. Energy efficiency is a hot topic in the home appliance world, which is why the Gaggia comes with an energy saving standby mode. After one hour the machine automatically enters standby. While in this mode, it uses less than 1W each hour. The main downside of the Brera is that it’s a relatively slow coffee machine. The stainless steel design also requires regular maintenance if you want it to maintain its stylish appearance. On the other hand, it’s quieter than many other bean-to-cup models. We think the Gaggia Brera is a great model if you plan to use both whole beans and ground coffee. With its tasty espresso and frothy cappuccino, it’s easy to recommend this model. Click here to view this coffee machine. With its impressive array of settings and multiple programmable modes, the ECAM44.660.B is an excellent model if you want more control over your coffee. 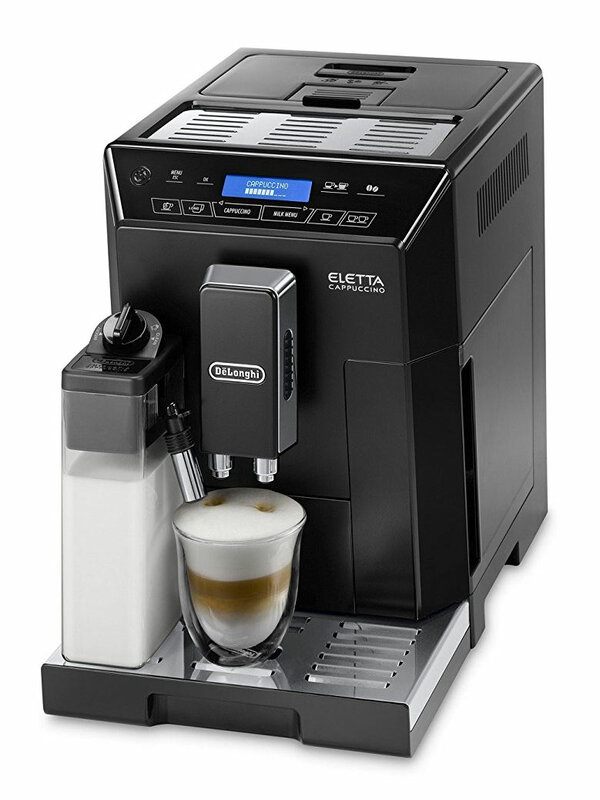 The Delonghi Eletta ECAM44.660.B was first released in 2014 – and has proven to be a popular model amongst buyers. It’s a fully automatic coffee machine with a variety of settings, making it perfect if you want precise control over how your coffee tastes. The stand-out feature of the Eletta ECAM44.660.B is its versatility. With a single button press it makes a variety of coffees, including caffelatte, cappuccino, long and lattemacchiato espresso, while allowing you to customise the aroma and temperature. The milk carafe can heat and froth milk directly into the coffee, with settings for both lattes and cappuccinos. It also has a memory feature so you can save the perfect combination of milk, water and coffee. Other features of the ECAM44.660.B include a twin boiler system, allowing for two cups, and a descaling programme for easy cleaning. The model also comes with a long-life burr grinder with an impressive 13 settings, allowing you to choose your ideal coarseness. We think the key-word for the ECAM44.660.B is “customisation.” With settings for temperature, grinding coarseness, aroma, milk and type, you’re free to tinker with your coffee until you find your perfect combination. It’s also been highly rated by buyers, who praise the rich crema and the handy descaling mode. If you want to find out the price for this excellent model, click here to view it. The E6 produces outstanding espresso and is easy to use. If you’re looking for a bean-to-cup coffee maker that produces both espressos and cappuccinos, the Jura E6 is an option to consider. This coffee machine isn’t cheap, but produces outstanding espresso with a rich crema. Built with an adjustable burr grinder, the Jura can grind beans consistently while keeping their aroma. It’s great for producing espresso with an attractive crema and the built-in water filters remove chlorine and other trace substances to make sure your coffee tastes pure. It’s also simple to use, with a 3″ colour TFT screen and intuitive control panel. One of the best features of this coffee machine is the “Pulse Extraction Process.” While this might sound like a marketing gimmick, it pulses water through the beans for a richer and fuller flavour. It also has a built-in milk frother, 15 bar pump and thermo-block technology for more consistent brewing. This bean-to-cup espresso machine does have some drawbacks though. The milk is only lukewarm, which may be a problem if you enjoy piping hot cappuccino and latte. There also isn’t an option to use pre-ground coffee. Despite these drawbacks, the Jura E6 is a great option if you’re prepared to pay a bit more for a flavoursome and rich espresso. Click here to see its price. Note: The E6 replaces the ENA Micro 1 on this list. This was a compact bean-to-cup coffee machine that was great for producing a single cup of espresso. Sadly, the Micro 1 is no longer available, although the E6 is a worthy upgrade. 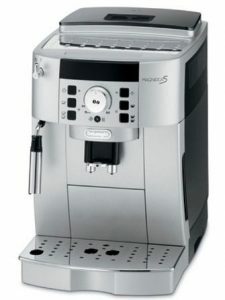 The Delonghi ECAM22.110.SB is cheaper than the ECAM44.660.B, but still has a cappuccino system and adjustable grinder. The ECAM22.110.SB is another popular bean-to-cup coffee machine from Delonghi. It’s cheaper than the other ECAM model on this list, but that doesn’t mean it’s not up to scratch. With a range of features and excellent reviews from buyers, this is a serious machine that produces a great coffee. To start with, the ECAM22.110.SB comes with a Cappuccino System. This combines milk, air and steam to produce an appetising froth. Reviewers have also praised the quality of the espresso and the rich crema. Other features include a control panel for customising your perfect coffee, “silent” grinder with 13 settings and an easy-to-clean design. Aside from espresso and cappuccino, the ECAM22.110.SB is also capable of producing a latte using the Cappuccino System. One of the great things about this model is that it’s easy to use. While you can adjust the coffee to your liking with settings for coffee dosage, water amount and grind coarseness, the buttons are intuitive so you’ll feel comfortable after a few uses. It’s also relatively fast. If you’re looking for a low/mid-range bean-to-cup coffee maker that provides control over its coffee output, the Delonghi ECAM22.110.SB could be a great option. With its Cappuccino System, quiet grinder and ability to prepare two cups at the same time, this a machine that’s perfectly suited for family life. Click here to view its price. The Barista Express has a professional appearance and a variety of features, including high-pressure steam for milk texturing. If you want to recreate the coffee-shop experience without leaving the house, the Sage Barista Express is definitely an option to consider. With its built-in grinder, ground coffee dispenser, extensive customisation settings and steam pipe for milk frothing, this model provides the satisfaction of producing your own espresso. The first thing to note is that this isn’t a “true” bean-to-cup machine. Instead, it’s a a manual espresso machine with a built-in grinder. While it can grind fresh beans, you’ll need to tamp the ground coffee yourself. As you would expect from a Sage coffee machine, the Barista Express has an impressive feature list. The grinder has 18 different settings for coarseness, which is more than most of the other models on this list. It can also provide instant hot water if you want to pre-heat your cup or make a long black coffee. Other features include “pre-infusion” at low pressure, which soaks the coffee for a better taste, and a high pressure steam pipe for texturing milk. The most important question, however, is can the Barista Express make a good espresso? Fortunately, the answer is a resounding “yes.” The espressos are flavoursome and enjoyable to drink, although the crema can be hit-or-miss when it comes to colour. It’s also relatively quick. It can make cappuccinos, although it may take some practice to get the milk frothing just right. One thing to note about the Barista Express is that the number of settings can initially be overwhelming. While it’s great to customise your coffee, it may take a few tries to find the perfect combination of bean coarseness and dosage. In summary, if you’re looking for a barista-style experience in your kitchen, the Barista Express is a great option. It comes with a variety of accessories and has received excellent reviews from many online buyers. Click here to view its price. The Russell Hobbs 22000 is a low-priced alternative to the other bean-to-cup machines on this list. 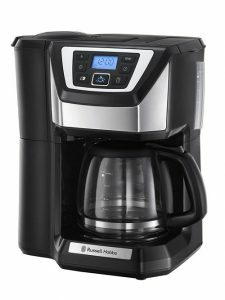 The Russell Hobbs 22000 is by far the cheapest bean-to-cup coffee machine on this list. We’ve actually cheated a bit though, as it’s not a true bean-to-cup machine. It’s effectively a filter machine that comes with a grinding feature. But with an RRP of just £129.99 (although it’s often available for considerably less than this) it’s one of the best options if you’re on a tight budget. As you would expect from such a low-priced model, however, it doesn’t come with many of the features of others on this list. To use the 22000, you first need to grind beans in the supplied grinding mill. There are several settings for coarseness. Once ground, you add coffee to the machine, choose the quantity and strength and press go. The coffee is then filtered, and the 22000 can produce up to 12 cups of coffee in in one go. While it’s a relatively basic coffee machine, the Russell Hobbs 22000 still comes with some useful features. These include a 24-hour programmable timer, so you can brew coffee automatically at set times in the day, and a heat plate for making sure your coffee stays warm. You wouldn’t expect the 22000 to produce the same quality of coffee as machines costing £300+. Even so, several reviewers praise the taste and also mention that it comes out reasonably hot. There are some complaints of a plastic taste to the coffee, although this seems to go away if washed correctly. If you’re looking for a budget bean-to-cup coffee machine, the Russell Hobbs 22000 is certainly an option to consider. Again, it’s not a true bean-to-cup machine, but it’s far cheaper and can still produce a tasty black coffee. For greater customisation, espresso, cappuccinos and other advanced features, however, the 22000 can’t match more expensive models. Click here to view its price. The Melitta E953-102 Caffeo has a variety of options, including several brew temperatures and a cup warmer. 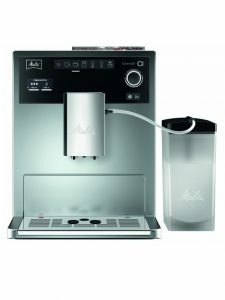 With its imposing design and strong reviews from buyers, the Melitta E953-102 Caffeo is certainly a bean-to-cup coffee machine that stands out. It also has a number of useful features and a relatively low price tag, making it an attractive model for coffee enthusiasts. The E953-102 Caffeo has an integrated grinder with three settings for coarseness. This is fewer settings than many of the other models on this list, but still provides some level of control over the coffee’s taste. Other settings include brewing temperatures and strengths. It’s also capable of making cappuccino with a creamy froth due to its built-in milk steam pipe. Aside from its brewing settings, the E953-102 Caffeo has a number of other features. These include energy-efficient lights, a cup warmer, 2-cup option and a standby mode. You can also adjust the height of the spout depending on the size of your cups. 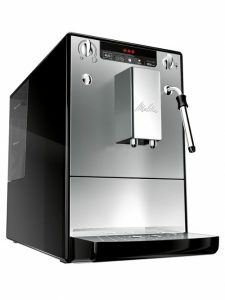 Most importantly, reviewers praise the quality of the espresso with many claiming that if you “love coffee, you’ll love this machine.” While the model requires cleaning every few months, and this can be quite an involved process, we think it’s worth the effort considering the quality of the coffee. If you’re looking for a mid-range coffee machine that allows you to adjust coffee to your taste, has a milk frothing pipe and produces fantastic espresso, the Melitta E953-102 Caffeo is a great option. While it’s relatively loud and requires cleaning every few months, the same can be said for almost any bean-to-cup machine – but most don’t provide the same level of value. Click here to view its price. With automatic tamping, milk texturing, grinding and an over-pressure valve, the Oracle has many features you’d expect on a cafe-quality machine. The Sage the Oracle bean-to-cup coffee machine is by far the most expensive model on this list. With an RRP of £1599, you would expect cafe-quality features from this model – and that’s exactly what you get. While all the models on this list can produce coffee from beans, the Oracle is truly automatic. It grinds, tamps and doses the coffee – and can also automatically texture the milk. Considering milk texture is one of the most difficult parts of making a high-quality cappuccino, this is a welcome feature. The model also has a steam boiler to deliver steam whenever you need it. It is even able to add texture to the milk while extracting the espresso, which can infuse the espresso aroma into the coffee more effectively. Another stand-out features of the Oracle is its over-pressure valve. Unlike other machines, this reduces the maximum pressure when extracting coffee to stop bitterness. Other features include an attractive and professional design and pre-infusion. There’s no doubt that the Oracle is an excellent bean-to-cup coffee machine. It comes with a wide range of features, a truly automated process and ability to produce outstanding espresso, lattes and cappuccino. Sage will even send one of their coffee experts to set it up in your home (this service includes setup, tuning and a guide to use). But is it worth the money? Reviewers certainly think so, with many praising the taste of the coffee and its customisation options. While it’s a pricey machine, we don’t hesitate to recommend the Oracle. Click here to view its price. The Melitta E970-101 can store up to four coffee preferences. The E970 Caffeo CI is more expensive than the E953-102, but comes with a range of features to justify the extra cost. These include a memory system for storing up to four coffee presets, a two-chamber bean container and a one-touch system. Like the other Caffeo model on this list, the E970 allows you to adjust how your coffee is made to get the perfect taste. It can produce both cappuccino and espresso, while the taste can be maximised using the pre-brew function. The machine also includes settings for brew temperature (three options) and coffee strength (four options). Aside from the coffee settings, the E970 includes a variety of other features. Examples are the programmable memory function, height adjustable spout (which is used for coffee, milk and water), energy saving features and a water filter. In addition, there is a button for 0W power when you don’t need the machine to be on. While the E970-101 isn’t cheap, we still think it provides excellent value for money. The combination of intelligent grinder, coffee settings and programmable memory make it simple to use after your first few cups of coffee, and it has received strong reviews from most buyers. Click here to view its price. Bean-to-cup coffee machines provide the freshest coffee, but they certainly aren’t cheap. While some cost less than £100 (see the Russell Hobbs 22000 above), most are at least £200 and can range up to over £1500 for the most expensive models. With such high prices, it’s vital to know how to choose a model that suits your coffee tastes and requirements. Here’s an overview of the most important factors. 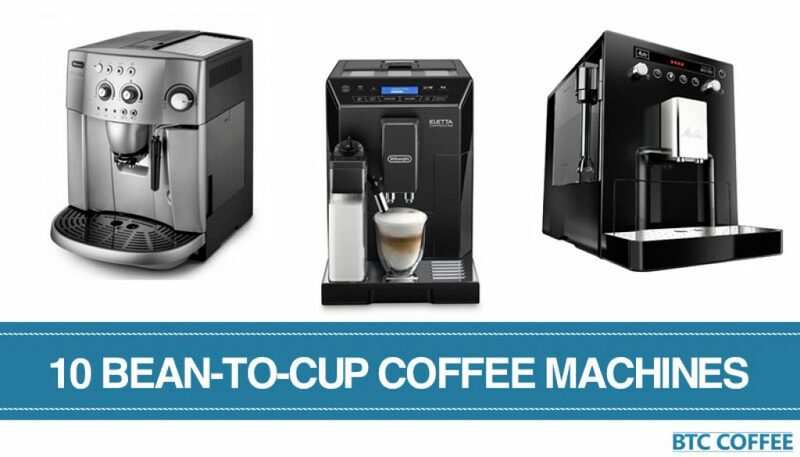 As we mentioned, bean-to-cup coffee machine prices range from a few hundred right up to a £2000 for consumer models (coffee shop machines cost considerably more). But what do you get for your money? And how much do you need to spend? The short answer is that the more you spend, the more automated the machine is likely to be. Pricier models also tend to produce tastier and more aromatic coffee with a professional crema, although this isn’t always the case. If you’re looking for a solid machine that makes a great espresso, you can certainly get one for under £500. Don’t expect to buy a top-quality bean to cup machine for under £200 though, unless you’re willing to buy second-hand or on sale. As you would expect, premium bean-to-cup coffee machines costing £500+ may also come with advanced features. 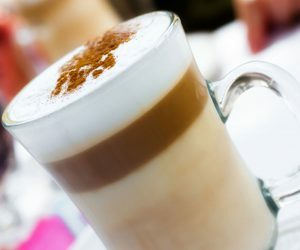 These are often centred around personalising your coffee, such as automated milk frothing for cappuccinos, but can include newer features such as built in Wi-Fi connectivity. For this reason, it’s important to set a budget you want to spend before you start searching for a model. It’s easy to get caught up in the excitement of buying a new machine and end up spending more than you want! Some people also make the mistake of buying the cheapest machine that appears to meet their requirements. A coffee machine can last years and produce thousands of cups of coffee. So it’s not a good idea, for example, to buy a clearly inferior machine just to save £30. The good news is that you can find some excellent machines in the £300-£500 range if you can’t afford a premium model. While these models often don’t include automated milk frothing, they can still produce rich and smooth coffee. 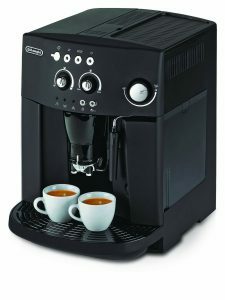 And if you can afford to spend a bit more, many of the best coffee machines (in our opinion) also cost less than £700. For this price you can often get automated milk frothing for cappuccinos. We HIGHLY recommend spending a bit extra on the freshest and best coffee beans for your new machine. The fresher the beans, the better your coffee will taste. Filter coffee machines are the most basic. Water is poured into the machine, where it is heated and filtered through ground coffee. They provide excellent value and are great for serving large amounts of people, but only take ground coffee and can only make black coffee. Pod machines use capsules to make a variety of coffee types. They are usually cheaper upfront, although the pods can cost a lot in the long run. Unlike filter machines, they can produce espresso, although you are limited to the coffee blends and types sold by the machine’s brand. Pump machines are great if you want to produce espresso manually. You need to tamp, grind and craft your espresso without the automated features of a bean-to-cup machine. While coffee enthusiasts may love making their coffee by hand, it’s a slow process that requires patience and skill. 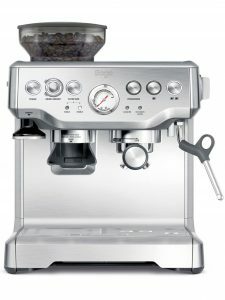 Bean-to-cup machines, as you already know, grind whole coffee beans into a tasty espresso with their built in grinder. While they are expensive initially, you can use any beans or ground coffee. They are also fast, automated and far more consistent than pump machines. To summarise, if you’re a coffee enthusiast who wants fresh coffee without spending lots of time, bean-to-cup coffee machines are almost certainly the best choice (that’s why they are sometimes called a fresh coffee maker). For making the occasional espresso a pod machine could be a good option, while for complete control you might want a pump machine. We all have our own taste when it comes to coffee. One of the great things about a bean-to-cup coffee machine is that they provide control over exactly how your coffee tastes. Aside from being able to use any type of bean or ground coffee, most machines have a variety of settings. Some also allow you to save various pre-sets once you’ve found your perfect combination. Not all machines have the same options though – some offer more customisation than others. Nearly all machines offer settings for grinding coarseness, for example, but some have just a few options while others offer 15 or more. The “correct” coarseness is dependent on how long the coffee will be exposed to water. For short times, you should use a finer grind, while for longer brewing a coarser grind is required to prevent over-extraction. Other customisation features can include brewing temperature, coffee strength, automatic milk frothing, cup size and water amount. Some models also come with pre-infusion which helps protect against inconsistencies in tamp and grind (see the video below for a simple explanation). If you enjoy creamy cappuccinos or lattes, you’ll need to buy a coffee machine with milk steamer. Fortunately, most bean-to-cup models have a milk frother. There are broadly two types of milk frother though: manual and automatic. Manual frothers are often found on cheaper machines. They can froth milk effectively, although it might take some practice to get the perfect cappuccino. Automatic frothers, on the other hand, are usually only found on higher priced models. These froth the milk inside the machine, and can make creamy cappuccino far more consistently. If you just want espresso, however, then you don’t need to worry about getting a milk frother. Unlike filter coffee machines, which can produce coffee for many people at the same time, a bean-to-cup machine typically only makes one espresso. Some machines come with the option of making two cups of coffee at the same time, however, which is great for couples as the first coffee won’t be cold by the time the second is ready. More machines are being built with multiple cup brewing, but there are still many that can only make a single cup at a time. One of the most common complaints about bean-to-cup coffee machines is that they can be difficult to clean. The good news is that many modern machines come with cleaning programmes that handle much of the manual cleaning – although there is always going to be some cleaning required. Some machines, for example, include descaling programmes. These can be run every few months to prevent limescale buildup. Automatic rinsing programs are also common. It’s not just the cleaning programmes that affects how easy a machine is to maintain though. The brewing unit should be easy to remove and clean. While you would expect pricier models to provide more cleaning automation, premium models often have more components that can be removed and cleaned. This helps to keep the machine in top condition but adds to the maintenance time. Brand. We always recommend buying a coffee machine based on the quality of the model – not just because it’s made by a popular brand. Even so, there are some bean-to-cup coffee machine brands with a reputation for producing high-quality models. Examples include Delonghi, Melitta, Sage by Heston Blumenthal and Jura. Warranty. Like all expensive purchases, it’s important to be covered by a warranty in-case anything goes wrong. Even the best coffee maker can develop a fault, so it pays to be covered. Bean and Ground Coffee Modes. It’s often convenient to make coffee from ground coffee as well as beans – especially if you sometimes drink decaf or just enjoy trying different blends. Most bean-to-cup machines offer this feature but check before you buy. Wattage. While wattage isn’t a major buying factor for this type of product, higher wattage coffee machines usually heat water faster. If you’re often in a hurry for your coffee, this can be important. Pressure. As a general rule, a coffee machine should have a pressure of 15-19 bar. This causes steam to be pushed through the coffee at the correct speed to avoid bitterness. Most bean-to-cup machines have a 15 bar pressure, but it’s worth checking before you buy. Connectivity. If you want to turn on your coffee machine from your bed or on your way home, Wi-Fi connectivity is a useful feature. At the moment, most coffee machines can’t connect to Wi-Fi, although we are starting to see this feature on newer models. We predict that “smart” coffee machines will become increasingly common over the next few years. Size. Bean-to-cup coffee makers tend to be larger than other types. This is because they need to include a built-in grinder. While there are some compact options on the market, it’s important to check the dimensions before you buy – especially if you have a small kitchen. Why Buy a Bean-to-Coffee Machine? Simplicity. Coffee making can be just as much an art as a science, but bean-to-cup machines make it easy. Most machines can make an aromatic and appetising espresso at a single button press, while allowing you to customise the taste to your liking. The fully automatic machines can also make cappuccinos and lattes. Freshness. We’ve mentioned it before, but coffee nearly always tastes better when made from freshly ground beans. When you grind beans and use them immediately, there isn’t any time for the flavour to evaporate. Speed. Most machines make coffee with just a few button presses, which takes much of the time out of coffee making. The more advanced machines have a variety of settings and options, but are still quick to use once you’ve got the hang of it. Convenience. While bean-to-cup machines are designed to make coffee directly from beans, many also take ground coffee. So if you love trying a variety of coffee flavours but don’t want to be forced to buy a certain brand’s coffee pods (as is the case with pod machines), a bean-to-cup is a great option. It’s also important to be aware of the drawbacks. While many coffee-lovers adore bean-to-cup machines, they tend to be more expensive than capsule coffee machines. This is partly counteracted by not needing expensive pods, but is still important to keep in mind. Bean-to-cup coffee makers are also usually quite large and are noisy when grinding beans. If you love fresh coffee, however, then there really is nothing better than grinding fresh beans for your breakfast coffee! Are Bean-to-Cup Models Any Good? This is a common question – and the answer is always: it depends! If the question “can the best bean-to-cup coffee machines brew rich, smooth and tasty coffee?” then the answer is a resounding “yes!” The only caveat is that you need to buy an excellent machine, which is exactly what the top 10 list above will help you with. But if the question is “is a bean-to-cup coffee machine the best option for me?” then the answer is more complicated. As we mentioned earlier, bean-to-cup machines produce the freshest coffee. They are more versatile, as you can use beans or ground coffee from any brand, and they offer extensive customisation. But that doesn’t mean they are right for everyone in the UK. If you want to brew large amounts of coffee for guests, for example, a simple filter machine might work best. And if you want a variety of coffees and hot chocolates available almost-instantly, then a pod machine might be a good option. For most coffee enthusiasts, however, a bean-to-cup machine is an excellent choice. But Doesn’t Ground Coffee Remain Fresh if it’s Refrigerated? Unfortunately not. As soon as beans are ground they start to lose their aromatic oils. There is nothing that can be done to stop this. While fast packaging and sealing can minimise the loss of taste, ground coffee will never taste as fresh as coffee made directly from beans. That doesn’t mean ground coffee can’t have an excellent taste – it just won’t be as fresh. Where’s the Best Place to Find Machine Reviews? The first place is right here! We write reviews of all the top bean-to-cup espresso machines – just use the menu above to view them by brand or feature. Another great place to find reviews is online shopping sites. The great thing about these sites is you can read reviews from real people who’ve spent their own money on a machine. This is completely different to reading reviews by professionals who have often been given the machine for free. A quick warning though: every product will have some negative reviews. The key is to look for products that have a majority of positive reviews from buyers who praise the specific features you’re most interested in. Which is the Best Model for Home Use? All of the information on this page has been written with home users in mind. While there are many commercial bean-to-cup coffee machines, they are usually more expensive and unnecessary for home use. In short: any of the top 10 coffee makers on this page are suitable for home use in the UK. Which is the Best Automatic Coffee Machine? While all bean-to-cup machines produce coffee from beans with a single button click, some take the process further and can automatically produce cappuccinos and lattes via a built-in milk frother. These machines are usually more expensive than those with a manual milk frother. We think the best automatic coffee maker is the Delonghi Eletta. 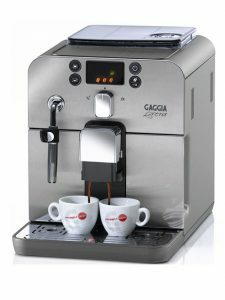 It can produce a variety of coffees, including cappuccino and caffelatte, with a single button press. You can also choose from a variety of froth settings to get your ideal coffee. Why Are Bean-to-Cup Machines so Expensive? The main reason is that bean-to-cup coffee machines include technology and components that aren’t required in pod or filter machines. In particular, the grinder adds cost to the machine. Combining a coffee grinder and maker into one machine costs more than keeping them separate, but the extra convenience is worth it. If you spend a lot in coffee shops, however, then you may find buying a coffee grinder machine saves you money in the long run. Which are the Best Cheap Bean-to-Cup Coffee Machines? Best “ultra-cheap” option -> At this price range your only option is the Russell Hobbs 22000 Chester Grind and Brew. It’s not a true bean-to-cup machine, but it can make a filter coffee using fresh beans. Best budget option -> When you get above £200 there are some surprisingly good options available. Our favourite is the Delonghi Magnifica. It provides outstanding value due to its frothing arm, one-touch operation and 2-year guarantee. Grinding coffee beans is almost impossible to do quietly. While some grinders are quieter than others, you probably don’t want to be using the coffee machine (at least when using fresh beans) at times when you could wake people up. This is especially important if you live in a flat or small home and enjoy a late-night cup of coffee. The good news is that grinding is over fairly quickly. Once it’s done, a bean-to-cup machine is no noisier than any other coffee machine. Many people also find the sound of grinding beans a part of the experience of having fresh coffee – so it’s often not a major problem. Which is the Best Quiet Bean-to-Cup Coffee Machine? As we mentioned, it’s impossible to grind coffee beans without making some noise. Some machines are certainly quieter than others, but decibel noise-level isn’t information that’s often shared by manufacturers in the UK. During our research, we’ve found that the Gaggia Brera is one of the quietest bean-to-cup machines. So if you’re looking for a quiet model, this is a good place to start. Where to Find One on Sale or Discounted? Many retailers run a periodic sale on coffee machines. In the UK, some of the most popular retailers when looking for a sale include Amazon, Argos and Currys. In the US, you might want to look at Best Buy or other stores, but this site focuses on the UK so it’s hard to give specific advice. Well done for reaching the end of this mammoth guide! If you’ve read the entire page, you should be far better equipped to choose the best bean-to-cup coffee machine for your requirements. Even if you’ve only skimmed the page, hopefully you’ve learned enough to know what to look for. While a bean-to-cup espresso machine has a number of benefits, including fresher coffee and a simpler coffee making process, it’s still important to be aware of their downsides. They tend to be bulky, due to the built-in grinder, and are loud when grinding beans (this is unavoidable). Despite these minor drawbacks, bean-to-cup coffee makers are probably the best way to get cafe-style espresso, cappuccino and latte from the comfort of your own home. If you love coffee, there really isn’t a better feeling than the smell of coffee made freshly from beans in the morning. We’re confident that you’ll never go back to pod or filter coffee after trying it! If you have any questions or comments about bean-to-cup coffee makers, choosing beans or anything else – let us know in the comments section.